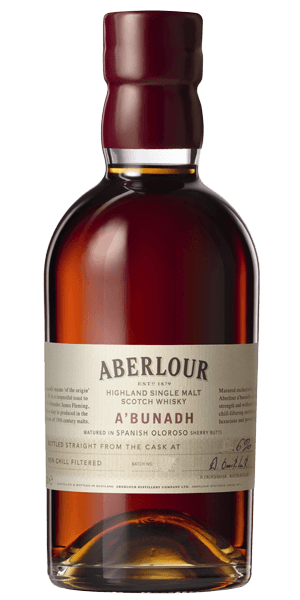 Aberlour A’bunadh is made in batches, and each batch is made by hand. It’s a cask strength Scotch Whisky that has achieved cult status among Whisky connoisseurs (and others). In Gaelic, A’bunadh means The Original, it’s a homage to Aberlour’s founder, James Fleming, produced using traditional methods without chill filtration or other modern processes. This fantastic Speysider was matured in Spanish Oloroso Sherry butts, and comes with an exceedingly high ABV. Powerful, POWERFUL. What does Aberlour A'bunadh taste like? The Flavor Spiral™ shows the most common flavors that you'll taste in Aberlour A'bunadh and gives you a chance to have a taste of it before actually tasting it. Allspice, praline and spiced orange, in harmony with deep notes of Oloroso Sherry. This is a special whisky among many a good whisky! Fabulous all round. Never tasted better. Loved this. So smooth...great flavor. All kinds of cherry and spice. Delicious! Smooth,warm caramel taste with a excellent kick to finish. Perfect! This is a fabulous scotch. Spicy on the nose. Starts sweet and finishes with a bang! This will become my daily driver for sure. Great sherry bomb.. Awesome flavor at full strentgh. Tasty! Interesting that I like the cask amagn better but this one is a keeper! Though I am new at this ... my first impression of this whiskey was it had a very pleasant smell and was smooth on the tongue, the flavor rich and sweet. The finish was warm and lasting and had a great flavor. Tasted like a higher proof Dalmore 12 to me (Not a bad thing at all). I'll come back to it in a year or so to see if I get more out of it. Rich, smooth, sweet. Burns a bit more than I like, but a little ice tames the fire and opens up the flavors. Non-chill filtration gives this scotch a slight viscosity, which, combined with its rich, deep sweetness, creates an almost syrupy drink. My new favorite. Very smooth and tasty scotch. Becoming one of my favorites. A little more alcohol burn but such intense flavors! A drop or two of water smoothes it out a little. I think I'm in love with this whisky. Warm spiced fruit and sherry aroma; the first sip was "woah!" then "WOW" as the tingling worked its way throughout my mouth and just kept going. The second sip was like a luxurious glass of wine hitting the tongue, then it magically turned into hot sherry. Finished with a satisfying, lingering warm. I haven't even tried it with water yet, such a pleasure to drink. I found this to be modest in flavor. A little water helps. Cherry, sherry, and fruit perfection. It's like liquid dessert. This is one of my all-time favorite scotches, hands down. Great scotch good flavor with notes of caramel. A great scotch, extremely complex. Very fruity on the nose. Starting on the palette you feel like you're drinking brandy, with heavy grape and fruity notes. The transition to more traditional scotch notes follow, with a finish of cinnamon, caramel, and fruit cake. Now this is the bomb! Super impressed by the nose: caramel, vanilla and a hint of turpentine (just kidding, but it does have a wisp of strength to it.) Superb dram! Really smooth, very tasty, accessible even to non-scotch drinkers. Would definitely buy again. Fabulous and everything I expected in a quality scotch. The finish is very satisfying for the ABV and the smoothness is the best feature. This will be hard not to make my go to. Thoroughly enjoy this wonderful scotch!!! Very appealing to the nose and palate! For 60%ABV , this is very smooth. Honey flavor right off the sip, long sweetness lingers, touch of smoke. Rocket fuel! Good with a bit of water or an ice cube to tone it down a bit. Nice spice. The lingering flavor for me is the oak and it feels a bit dry on the tail end. Hands down the best whisky/whiskey I've tried to date (granted, I've only about 3 years of experience). I wish I could find this one more often locally. If I could only pick one whiskey to take with me on a deserted island, this is it. The richness from the cask strength gives this Highland a lot of notes you'd typically get in a solid bourbon. Excellent. Arguably my favorite scotch. Really hits all of the high points that I enjoy. Sherry & spice & everything nice. Each batch seems ever so slightly different, but the high proof sherry cask finished flavors are lovely. There's a bit of a kick due to the high ABV. Very complex flavors especially for its price. All of the Aberlour scotches are fabulous. This is the best of the family!! Reviews are tempting me to request availability and price. Great taste. A little darker than I typically like. This scotch is hands down "my drink". Have I had "better/more expensive" scotch? Sure, but Aberlour for me is everything I ever wanted in a drink, and definitely the brand I would choose if I could only choose one.